Gorgeous sea views, a panoramic pool and quick access on foot to Kaki Lagada beach. Adriana occupies a privileged position where Paxos' vibrant green slopes meet the deep blue waters of the Ionian Sea. Separating the two, and just a couple of minutes' walk from Adriana, are the sun-whitened pebbles of Kaki Lagada beach, one of the island's loveliest. Inside: accommodation at Adriana is spread over two levels. The main entrance takes one into the open-plan living and dining area. Here, a beamed ceiling gives way to stone walls and then a triptych of large sliding glass doors, that both brings in the views and allows seamless access to the outdoor living and dining area and the pool. To one side are a pair of sofas an ornamental fireplace, while to the other is a dining table and a small but well-equipped corner kitchen. The ground floor is also home to two twin-double bedrooms, each with an en-suite shower room and direct access to the main sea-view terrace and pool. The master bedroom, situated on the first floor, is accessed via a spiral staircase in the entrance hall. It has stunning sea views, an en-suite shower room and its own superbly panoramic terrace. Some parts of the pool terrace at Adriana are overlooked by the balconies a couple of neighbouring properties. A road runs below the villa and traffic can be heard a little from the villa. For guests arriving in Corfu on a morning flight, a taxi transfer from Corfu Airport to Corfu New Port and the hydrofoil crossing from Corfu New Port to Gaios on Paxos are included in the rental fee for clients staying at Adriana. If your flight arrives in Corfu in the afternoon/evening after the last hydrofoil has left, a taxi from Corfu Airport to Corfu New Port is included, but a private sea taxi is not (however, we would be happy to organise for you). In this case, the return leg from Gaios harbour on Paxos to Corfu Airport for your flight home is of course still included. Due to the relatively limited number of hydrofoil/ferry connections between Corfu and Paxos in the shoulder seasons, if you are travelling outside July or August, we recommend you book flights that arrive in the morning of your first day or fly in the day before and spend a night in gorgeous Corfu Town. Similarly, for the return leg, we recommend you book a late afternoon/evening flight or fly out the next day. 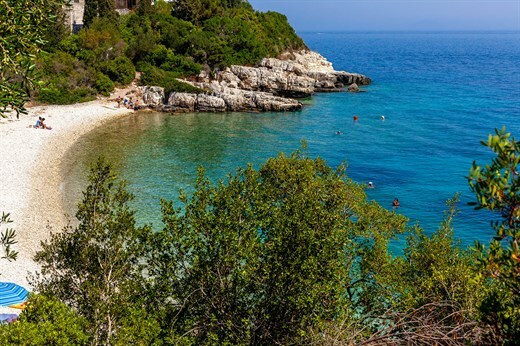 Adriana is situated just 2.5km north of Gaios, Paxos' main town and harbour, and about 4.5km south of Loggos. It overlooks and has easy access on foot to Kaki Lagada beach and is a quick drive away from a selection of other idyllic coves. Both Gaios and Loggos have a good selection of tavernas and shops and so you will never have to go far for anything you might need. "Adriana was absolutely fantastic, comfortable and had such fantastic views." We very much enjoyed our holiday, and enjoyed Adriana for its outside space and location. Adriana was much nicer than the photos. A week in Paxos was perfect. Amazing views at Villa Adriana. A beautiful and easy property to enjoy a holiday in. Adriana was absolutely fantastic, comfortable and had such fantastic views. This was the first time I've stayed in a villa and now I feel that staying in a villa is something I will do again. It felt so homely and gave us the freedom to plan our days, without any rush. We had a magical family holiday. The whole family loved it and we came back refreshed and very happy. We felt so lucky to have found a villa that had both a lovely, well-tended pool and access to the beach and we used both constantly. It was terrific not to have to jump in a car to get to a beach, the kids could wander there by themselves anytime. It's a great villa and I hope it might be available next year as well.